For more pictures of the book see the Flickr set. Quite some time ago, the Gapers Block book club read Devil in the White City. During the discussion of the book, a wise gentleman who'd lived in Chicago a very long time discussed having a copy of the World's Fair book of pictures and a cookbook put out by the Ladies Auxiliary of the fair. I'd had no idea anything like this existed so I of course ran to the internet and began my search. But the titles I found were so very expensive I couldn't justify the purchase. A year or so later, the gentleman (who I'm assuming would prefer to remain anonymous) returned, carrying both books and intending to present them to people who had expressed their desire for them during the book club, but they weren't present. He kindly gave me the Ladies Auxiliary cookbook and seemed pleased to see my face light up and my hands shake as he handed it to me, but he also seemed a bit sad to hand it away. I've kept it safe since then and have opened it casually several times. But each time it has seemed like such an overwhelming undertaking to begin a review of it that I put it away until my next ADD-riddled perusing. As you can see, it is a beautiful book. The design is so indicative of the time and so classic and I think that's part of what has intimidated me about the book. I also tend to splash things on pages of cookbooks and I definitely didn't want to do that with this one. Another reason it was so intimidating is that the recipes are so painfully vague for modern cooks that I honestly feel like I learn nothing about cooking when reading this book. For example, here is a recipe for French Loaf Cake: "One lb. sugar, 6 eggs, 1 lb. flour, 1/2 lb. butter, 1 cup milk, 2 tea-spoons baking soda, flavor to taste." Where's the rest of the instructions? How do I blend the ingredients together, what order, what size pan, should it be greased, what temperature should my oven be at, how long do I let it cook? So many questions, but this recipe is just a list of ingredients because if I lived at the time of the World's Fair I would know all of that. Right? And now? Now I can't even remember if I should sift flour for the cookies I never bake. But one very important kitchen item has been invented since this book was written. Ovens with a controllable thermostat weren't around when this book was written, which helps to explain some of the missing directions in the recipes in this book. "Cook long over low heat" is about as exact as I'm able to find in this book of recipes. One of my favorite details of this book is that every recipe is signed by the woman who offered it for publication. Some of the women's names are followed with "Sewanee, Tennessee" others are followed with "Alternate Lady Manager World's Fair, Franklin Falls, New Hampshire". This book is a study in bloated titles and penmanship if nothing else. Many of the recipes in this book are interesting from the perspective of how much things have changed. I have no problem making a number of things from scratch, but I've never thought about making my own yeast. But yet there are eight recipes for different types of yeast and two recipes for making your own baking powder. Aside from the recipes for terrapin (or turtle) soup and venison sausage, there are a few that seem out of date but ready for a revival. Watermelon pickle for example. I had this sprinkled over some barbecued ribs at Cochon in New Orleans last year and fell in love with it, but forgot about my desire to make it by the time watermelon season rolled around. And Corn Pone seems interesting. Considering how common wheat allergies are, baked goods made from corn seem like a perfectly easy substitute for a beginning gluten-free baker. And corn pone seems to be an unsweetened cornbread that is often baked or fried in hand-sized amounts instead of in a full skillet. Tonia Moxley of Biscuit Power explains a fair amount about what exactly corn pone is. She writes about it from an Appalachian perspective, but it was very popular in the general South and seems similar to ground cornbread-like items cooked in the Plains States. Preheat your oven to 425° F. Pour the buttermilk into the sifted corn meal and add the salt, beaten egg yolks, baking soda. Beat this with till smooth with a spoon. Add the cut up butter and stir until its evenly distributed. Bake as muffins or in a small casserole dish or oven-safe skillet. Bake for about 20 minutes, or until a broom straw toothpick comes out clean. Serve hot with a dollop of butter on top. Put 1 pt. beans into 2 qts. water, with a small soup bone, and boil 2 1/2 hours. Take out the bone, season the soup to taste, and thicken with 1/2 table-spoon flour, beaten smooth, in a little milk. Pea soup may be made in the same way. This recipe wasn't signed, but I think that is because it is such a generic recipe for something that must have seemed so obvious that it barely deserved a mention in a cookbook placed between the gumbo soup, the maccaroni (sic) soup, and Friar's Duck Soup. But since I'm looking forward to spring dishes and a bit burnt out on pots of beans, I decided to look for something else that seemed like an interesting dish that would go well with the corn pone. And I came across deviled chicken. Now I've heard of deviled chicken, but I thought it came in a small can that you could find beside the limburger cheese, sardines, and other stinky foods that need an "acquired taste" to enjoy them. A quick search for deviled chicken made me realize that the recipe in the cookbook was similar to what I could find online, so I merged some cooking time and temperature information with the ingredients in the cookbook to come up with a recipe that ended up going quite well with the corn pone. Preheat your oven to 425° F. Place a skillet or dutch oven over medium-high heat. Add 1 tablespoon of olive oil and the chopped onion. Let it cook for about 5-7 minutes until it starts to brown slightly and stir it frequently so it doesn't stick or burn. While the onion browns, prepare a paste of the remaining ingredients. Rinse the chicken and remove the skin if you like. Pat the pieces dry. Place the chicken in the skillet and cook on each side for 3-4 minutes, just until it starts to brown. Once both sides are cooked, brush the mustard mixture evenly over the chicken pieces. Cover with a lid or foil and place in the oven for 40 minutes to cook. The chicken should not bleed when pierced to the bone with a small knife. Sprinkle the chicken with paprika and serve immediately. While it's interesting to read through older cookbooks, and there is certainly plenty of inspiration I've gained from reading this book in particular, I don't think I'll be using it for a reference book very often. The instructions tend to be so vague and the measurements are hard to translate to modern day measures. How big is a teacup, exactly? But it's great to see what the Lady Managers of the World's Fair found worthy to submit to a cookbook that made its way across the country, and possibly the world. I'm sure curry powder was a rare treat in the Midwest, but it somehow made its way into a dish that Emma Lilette Oglesby of Elkhart, Illinois felt had to be shared with the world. And I'm glad that she and all the other women felt that it was worthy of being included. I have the same cookbook. 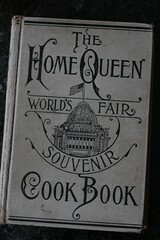 The Home Queen World's FAir Souvenir cookbook. It is really nice condition. All the pages are intact. Could you let me know what it is worth. I would like to buy a copy of this book. Would you be interested in listing it on eBay? I have this cook book, I would be interested in selling it. Great Condition. I have a copy of this book in excellent condition and would like to sell it. I have a Home Queen Cookbook 1898 by Dearborn Publishing company. I have no idea what it is worth, but would like to sell it now. I have a 1993 edition. Just bought at an antique store for $5.00-original cover. would like to purchase a "Worlds Fair" edition.